CHESTER— The board of selectmen Thursday agreed to begin negotiations with Essex Savings Bank for lease of the vacant bank space at town hall. At the special meeting Thursday, the board also approved the selection of a Groton engineering firm as the consultant for the Main Street project. Essex Savings Bank was the only area bank to respond to a request for proposals for the vacant space on the first floor of town hall that had been occupied by a Bank of America branch until last week. Bank of America had leased the 3,200- square- feet on the first floor since the town hall relocated to the building in 2003. Residents at an April 17 informational meeting had expressed strong support for offering the available space to another bank, with representatives of Essex Savings Bank announcing at the meeting the local bank was interested in opening a new branch at the town hall location. First Selectman Edmund Meehan said he would now begin direct negotiations with Essex Savings Bank for a multi-year lease of the space. The bank has agreed to a down payment of $18,982, representing three months rent, with a goal of concluding the lease agreement and opening the new bank branch by the end of the year. The final lease agreement between the town and the bank will require approval from voters at a town meeting. The board also unanimously approved a recommendation from the Main Street Project Committee to select the Groton firm of Kent & Frost LLC as the engineering and design consultant for the long-planned Main Street improvement project. The volunteer committee, appointed last year to coordinate and direct the project, had interviewed four firms before approving the recommendation to select Kent & Frost. Eleven firms had responded to the initial request for proposals that was published in March. Meehan said the firm would work with the committee to prepare a detailed town center master plan to guide the project by March 2013. The plan would include cost estimates for the street repairs and improvements, along with information on how to coordinate the Main Street work with the planned replacement of the Main Street bridge over Pattaconk Brook that is also expected to begin in 2013. The price for the consulting work is $66,030. 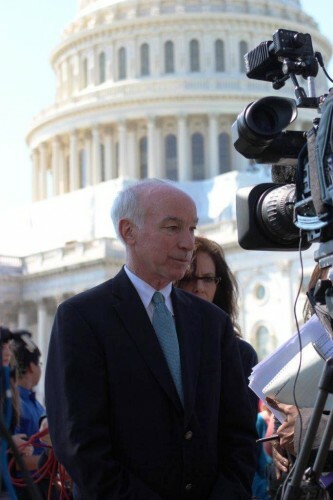 Terming the court’s decision, “a Landmark moment in the fight for stable, secure health coverage for all Americans,” Congressman Joe Courtney, whose district covers most of eastern Connecticut, lauded the U.S. Supreme Court’s June 28 decision that upheld the Affordable Care Act. The Congressman further noted that the Affordable Care Act “is not the final word on health care. This Congress and future Congresses can make commonsense amendments in response to real-life problems,” he said. As one example of amending the Act, the Congressman cited the new law now in place that permits young people to remain on their parents health care policies until they reach the age of 26. 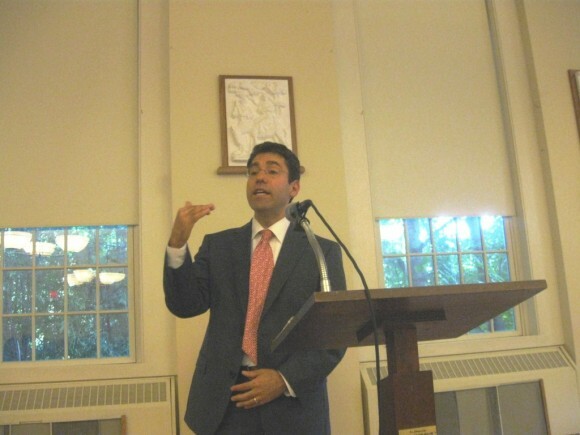 The Congressman said, “In eastern Connecticut last year, 4,600 young people were able to remain on their parents’ health policy until the age of 26 while they transitioned into the workforce, ” he said. In addition, since 2011 under the new health care law, “470 small businesses in the district received tax credits to maintain or expand health care coverage for their employees,” he said. “By 2014,” Courtney said, “ALL of eastern Connecticut’s residents with pre-existing conditions will be protected, and health insurers will not be able to deny them coverage.” “Also, by 2014 the district’s 570,000 residents with private insurance coverage will no longer face annual limits on coverage,” he said. 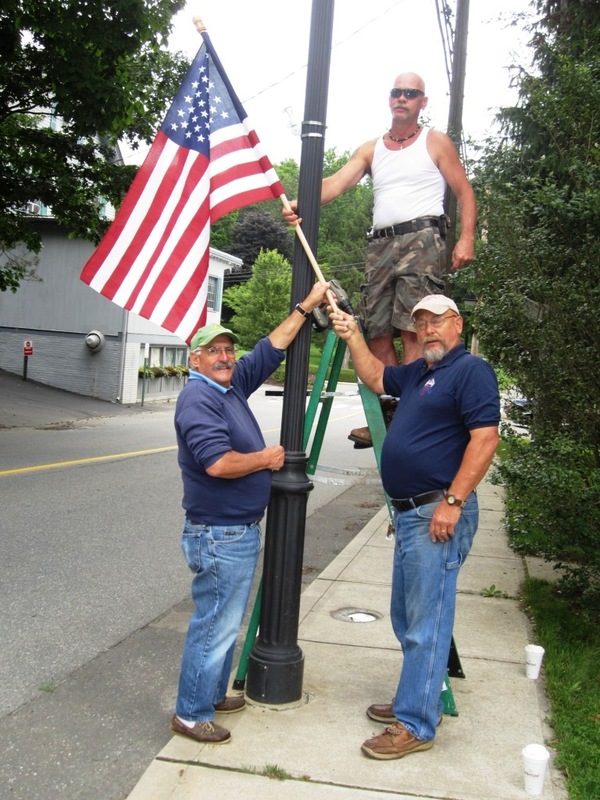 A group of patriotic residents of Ivoryton have recently installed American flags on all the lamp posts in the village of Ivoryton. This was done with the prior approval of the First Selectman of Essex, Norman Needleman. The idea for the flags was spearheaded by Cotty Barlow, Chris Shane & Jim Crowell with contributions from them as well as a donation from Essex Wines and Spirits and the Ivoryton Alliance. DEEP RIVER— The planning and zoning commission has voted to file an appeal in Middlesex Superior Court challenging the zoning board of appeals June 19 approval of a variance that would allow local resident George Bartlett to open a used car dealership in a former industrial building at 444 South Main St. (Route 154). The commission, which had opposed the Bartlett variance at the ZBA public hearing, discussed the situation for about 25 minutes in a closed session at it’s June 21 meeting before voting unanimously to direct its attorney, Middletown lawyer William Howard, to file a court appeal of the decision. 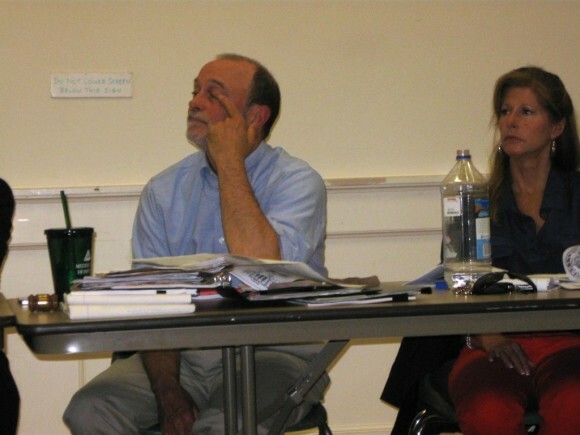 The commission directed Howard to “explore all of the issues he addressed” at the June 19 ZBA session. Bartlett, who was represented at the hearing by Essex lawyer Michael Wells, was seeking a variance of the local zoning regulation requiring at least 150-feet of road frontage for a car dealership in the industrial zone along Route 154 on the southern end of town. The parcel, the former Champion Tool and Dye company property on the west side of Route 154, has 144 feet of road frontage. Wells said Bartlett was unable to purchase a small strip of land from the abutting property to the north to meet the 150-foot requirement. But Howard, speaking for the commission and Zoning Enforcement Officer Cathy Jefferson, had maintained Bartlett was actually seeking a use variance because the regulation requiring at least 150 feet of road frontage applied to all parcels in the industrial zone. Howard also discounted the claim of a legal hardship related to the variance. The ZBA approved the variance on a 4-1 vote, with alternate Jerome Scharr opposed. Board Chairman Donald Grohs has recused himself from the appeal because he owns nearby property. The board determined the proposed used car dealership conformed with the historical use of the property and the character of the surrounding neighborhood, and that Bartlett’s inability to acquire abutting property to meet the 150-feet requirement represented a hardship. Wells had noted at the hearing the parcel had been a used car dealership in the 1960s. Smith said a similar PZC against ZBA court case occurred in Deep River more than a decade ago. He suggested having an “independent attorney” attempt to mediate the dispute before any possible court hearing. The legal notice for the ZBA decision on the Bartlett appeal was published Wednesday. Letter: Why Spend $27 Million on Out-of-State Tourism Campaign? This letter is in response to an article written by Shelly Banjo in the May 14, 2012 issue of the Wall Street Journal. The State of Connecticut has spent $27 million on a tourism campaign and hired Chowder, Inc., a NY advertising agency to lead it. Why isn’t our own government hiring ONLY local crews from within the state instead of partially outsourcing much needed jobs? Why has this money left the state? This is not the first time the state has outsourced its tourism campaign to NY. They did it in 2005. The Connecticut Department for Economic and Community Development’s Offices of Culture and Tourism is the same department that promotes Connecticut’s Film, Television and Digital Media industry through their production guide. It is filled with talented advertising agencies, graphic designers, writers, photographers, actors, film and television crews, etc. This is quite contradictory. On the contrary, I think Connecticut is awe-inspiring. We are home to some of the world’s most impressive corporations (PEZ, Lego North sails, Bigelow Tea, ESPN, World Wrestling Entertainment, Consumer Reports Auto Testing Center), universities (Yale, Wesleyan, Connecticut College), homesteads and museums (Mark Twain House, Harriet Beecher Stowe Center, the Florence Griswold Museum, the Wadsworth Athenaeum, the Hillstead Museum designed by Theodate Pope Riddle one of the first American women architects). We have the US Coast Guard Academy, Gillette Castle, The Goodpeed Opera House, the Bushnell Center for Performing Arts, Mystic Seaport which houses the largest collection of America’s Cup footage in the world and is the preeminent maritime museum worldwide, Mystic Aquarium and Dr. Robert Ballard’s renowned Institute for Exploration, the Essex Steam Train and River Boat, two of the country’s oldest and continuously running ferries, quaint historical villages, beaches, boating, state parks for camping and hiking, vineyards, Sail Fest where the world’s tall ship regularly converge, and the Connecticut River, hailed by the Nature Conservancy as one of the last 10 great places, just to name a few. 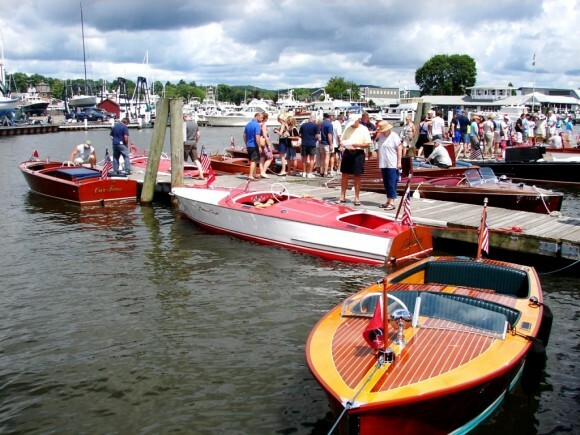 Banjo cites: “After spending $27 million on a soul-searching advertising campaign, Connecticut proclaimed Monday that the state is Still Revolutionary.” Here’s a slogan for you: Connecticut: Proud to be the Quiet, Cultural State. That will be $27 million dollars, please. 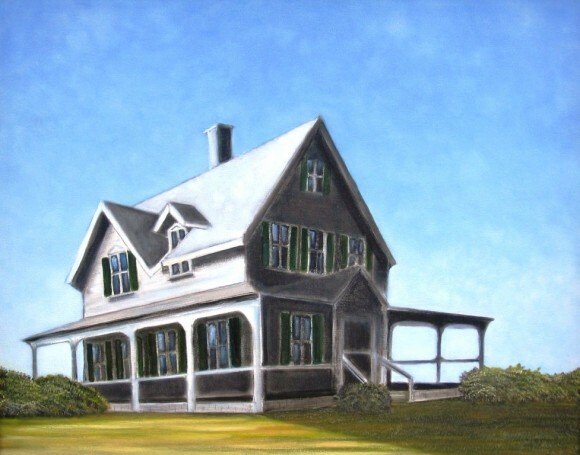 The Centerbrook Meeting House, located on Main Street in Centerbrook , has received the 2nd Annual Preservation Award from the Essex Historical Society . 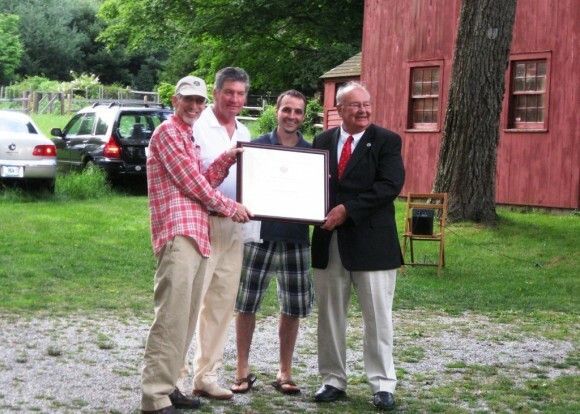 The award was presented on June 25 to two private benefactors who with their own private funds restored the historic structure, which was originally built in 1722. 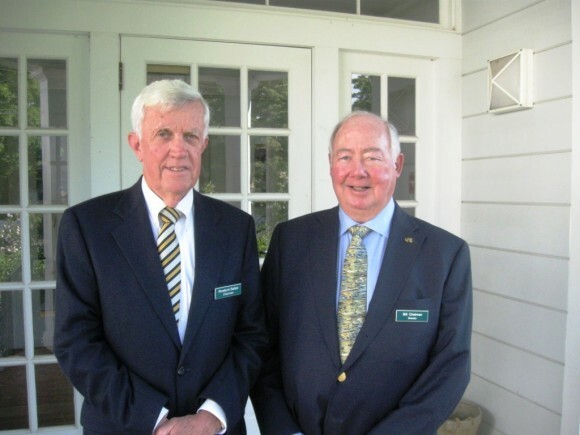 Recipients of the Society’s 2nd Annual Preservation Award were the two benefactors, Norman Needleman and Herb Clark of Essex. 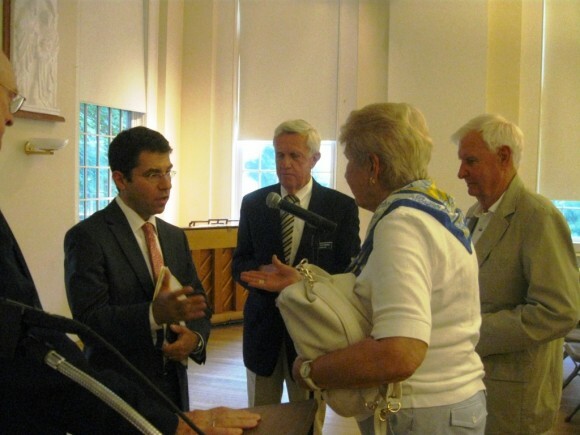 Needleman also serves as First Selectman of Essex, and Clark is the owner of many properties in the Town of Essex. 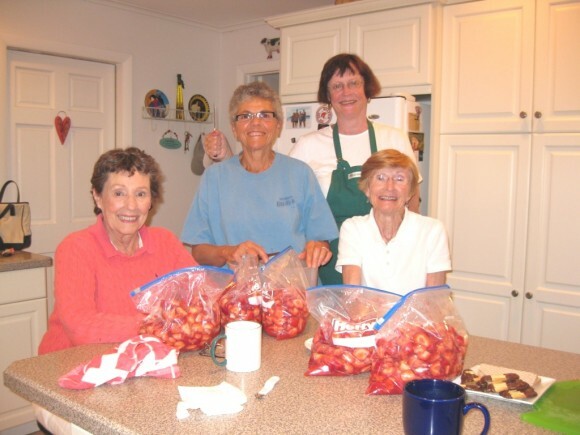 The presentation of the award was a part of a “Strawberry Social” at the Society headquarters at the Pratt House on West Avenue. 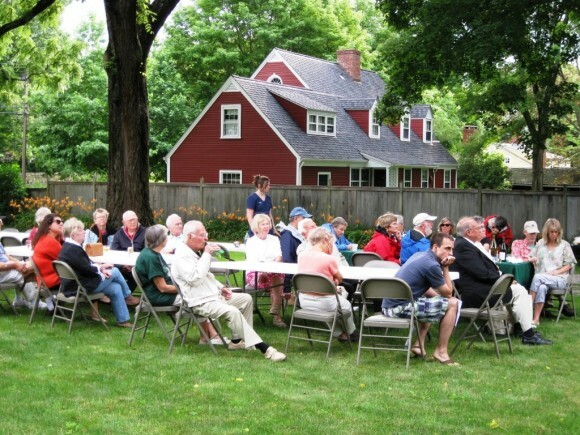 In addition to a picnic on the grounds, in the formal part of the program Essex Historical Society President Mark Pratt thanked the Society’s board and its volunteers. President Pratt also said that a professional adviser is now assisting the Society in structuring a fund raising program. Prior to the Preservation Award ceremony and the “Strawberry Social,” Essex Historical Society Vice President Susan Malan led a 4:30 p.m. walking tour of some of the historic landmarks of Essex. Included in the tour were the site of an old blacksmith’s shop on West Avenue, a number of churches on Prospect Street, as well as the former town hall, firehouse and elementary school. The former elementary school is now owned by the Roman Catholic Church on Prospect Street, and preservationists in town are fearful that it might be torn down, its historic significance notwithstanding. Malan’s walking tour ended where it began, at an 1833 Greek revival style structure on West Avenue, which was once the home of Hills Academy, and which now houses the headquarters of the Essex Historical Society. ESSEX— The board of selectmen has endorsed a change in the general retirement plan for town employees while also considering an enhancement of the existing merit service pension benefit for volunteer firefighters. The board last week approved a recommendation from First Selectman Norman Needleman for a change to the town retirement plan to would specify that part time employees working less than 30 hours per week are not eligible for retirement benefits. Existing language in the town’s plan allows employees working as few as 20 hours per week to accrue some pension benefits. Needleman said the change would apply only to new part-time hires, not current part-time employees. The proposed change will be presented at a public hearing and subsequent town meeting vote on July 18 beginning at 6:45 p.m. in town hall. Selectmen are also considering an enhancement of the merit service plan for volunteer firefighters that will be presented for approval by voters at a town meeting later this summer. Ethan Goller, a volunteer firemen who also serves on the appointed retirement board, told the selectmen last week the existing merit service plan has not been changed since it became effective in 1992. The current plan provides a pension stipend of $15 per month for each year of volunteer service when a firefighter becomes fully vested in the plan after ten years of service. The maximum pension payment under the plan is set at $450 per month. Goller said the Essex plan has fallen behind the incentives offered to volunteer firefighters in other nearby towns, which have a shorter vesting requirement or a higher monthly benefit. Goller requested increasing the multiplier in the merit service plan to $16.65 per month for each year of service with a maximum benefit limit of $500 per month. The enhancement would also be applied to a handful of retired volunteer firefighters currently receiving a pension payment. Selectmen agreed to discuss the proposal further at the board’s July 18 meeting. Essex volunteer firefighters also receive a property tax abatement under a separate plan that reduces a portion of the annual property tax bill for an active volunteer who earns points under guidelines established by the volunteer fire company. The maximum tax relief provided under this plan is $1,000 off the annual property tax bill. 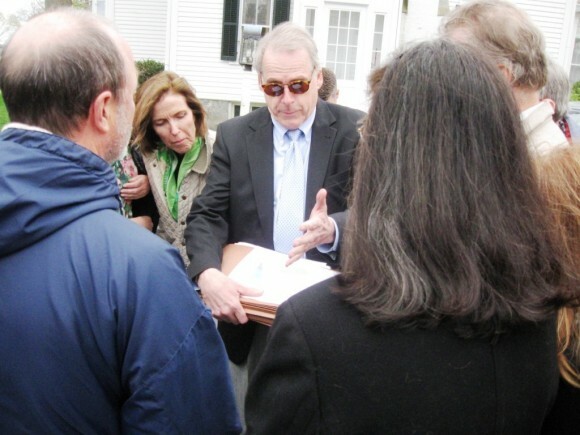 ESSEX— The board of selectmen has picked Vision Appraisal of Northboro, Mass. for a full town-wide property revaluation in 2013 that is expected to result in a steep drop in the grand list of taxable property. Assessor Jessica Graves recommended Vision Appraisal of the two qualified firms that submitted proposals for the state mandated revaluation. 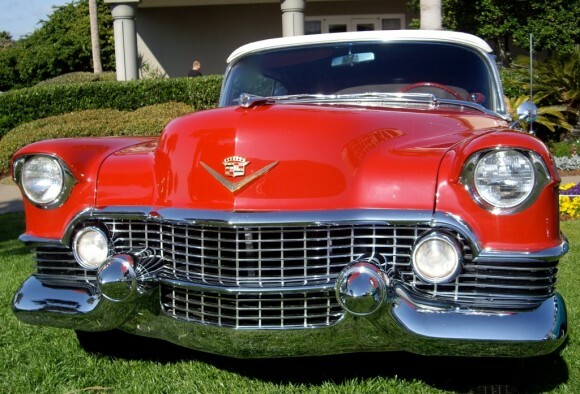 The Vision Appraisal price was $139,800, while a bid from Tyler Technologies of Norwich was $169,800. Graves said a third bid, which was slightly lower, was disqualified for various reasons, including inaccurate references. Selectmen approved hiring Vision Appraisal at a meeting Wednesday The town has about $240,000 set aside in a sinking fund to pay for the revaluation. Vision Appraisal performed the last full revaluation in 2003, and the statistical revaluation update that was completed in 2008. State law requires cities and towns to complete a full revaluation, with physical inspections of the interior and exterior of all residential, commercial and industrial properties, every ten years. A revaluation update must be done every five years. 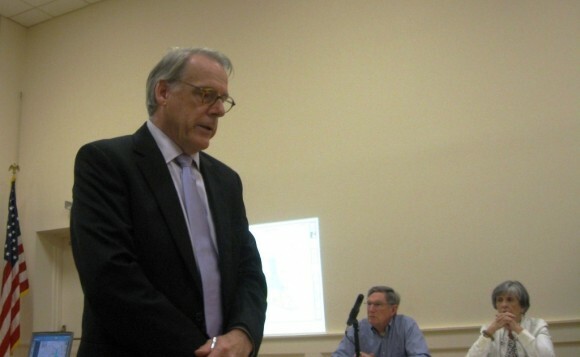 Graves, who has served as the Essex assessor for nearly a decade, acknowledged the 2013 revaluation would reflect the sharp decline in property values that has occurred in the wake of the national economic recession that began in 2008. Graves recalled the result in neighboring Deep River, where a full town-wide revaluation completed in 2010 resulted in an eight percent drop in the town’s grand list. The 2010 revaluation in Deep River was also done by Vision Appraisal. Graves said home sales in Essex have picked up in recent months, though most sales show a drop in prices and property values from sales that were recorded before 2008. Graves said a drop in the grand list is likely, though the extent of the decrease would not be clear until the revaluation is completed. New property assessments will be part of the October 2013 grand list that is filed early in 2014, with the new values reflected in the July 2014 property tax bills. Inspections of properties are expected to begin in the spring of 2013. I recently came home after visiting my son Arthur and his family just outside Ft. Lauderdale. That’s on the Atlantic side of Florida. While there, they took me to Naples on the opposite side of the peninsula. To the west, on the Gulf Coast. We took I-75, which darts across the Everglades. . It’s the fast route. In fact, it seems the only route. No sailor goes to sea without a compass. Well, nobody should set out on a long car trip without one, either. I found out the hard way. 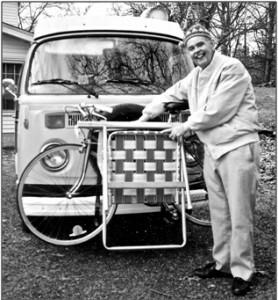 I was on my big solo trip around the U.S. in my Volkswagen microbus, Dandelion. I called her that because of her warm sunny color. I had come to Ft. Lauderdale to visit them. Here I am 20 years ago, setting out solo on my grand circle trip around the U.S. That mistake I made in the Everglades was a doozy. Very pleasant. On my final morning I said goodbye at 7 and hopped onto I-75 west. It’s called Alligator Alley. So-called because plenty of gators in the Glades plus other wildlife. I left early because I wanted to dart across the peninsula to get to Naples on the Gulf Coast by mid morning. It was overcast. I like sunshine but the gray sky would make my driving easier. The interstate was smooth, straight, and fast. And dull. It cut right through the Glades like an arrow. Swamps stretched far back on both sides. Arthur had told me I’d probably spot gators resting on the shore at the side of the highway and I kept looking. How exciting that would have been. Nothing. The grassy vastness of the famous swamp was relieved now and then by tiny isles with a few trees. Boring. So my only interest was in getting to Naples fast and enjoying the interesting Gulf Coast. An hour out, half way across, I came to a cloverleaf. On the left I could see a shopping center. A bit of civilization. Time for a break. I found a coffee shop. Enjoyed my coffee. Then stretched my legs checking out the few stores. In 30 minutes I was back on I-75. Still gray and gloomy. I’d make Naples easily by 10. Good. I drove another hour. The Everglades stretched on but were getting more built up now. Finally I reached the outskirts of Naples and kept a sharp eye for road signs. I saw one coming up. I-95, it said. I-95! But I-95 isn’t on the Gulf Coast. It’s on the east coast—the Atlantic. How could this be? I was shocked when I found out. What I had done, of course, was make a wrong turn back onto I-75 after my coffee break. I had headed east instead of west. I had made a 180-degree mistake! I was right back in Ft. Lauderdale! The clouds had hidden the sun. And there were no shadows. Nothing to tip me off to my mistake. I was too embarrassed to call Arthur and tell him. I noticed a Sears. I went right in and bought an auto compass. $4.95—I remember. Mounted it on my dashboard. Then headed west again. Now I’d be lucky to get to Naples by mid afternoon. What a little wonder that compass turned out to be. I‘d steer left and its needle would turn right. If I swung right, tt would compensate by moving left. It fascinated me. Serious navigators would worry about deviation and variation. I was curious. Did its needle always point north? I thought it might be affected up there on the dashboard by all the steel of Dandelion around it and the electronic stuff, too.I ran a little test. I placed it on the seat beside me. There would be less interference there. The needle spun wildly for a few seconds, then settled down. Same direction as before. Good. But heck, what difference would a small deviation make? Very minor. Let’s stay I’ve stopped at a restaurant in a suburb of a big city. Full, I return to my car. I want to get into the city. I’m confused. Which way? My map tells me that downtown is northeast. But which was is northeast? Instantly my compass shows me. I pick a road that makes sense. Abroad I carry a little compass in my pocket. I decide to go visit a park. My map shows me it is southwest. I choose a trolley, say, heading that way. It twists and turns for 30 minutes and when we’re close, I get off. I stroll through the park and enjoy it. Exit by a different gate. How to get back to where I started? Well, I had traveled southwest. Now I know I should travel northeast. That’s valuable info. So I make sure I take a trolley going as close to northeast as possible. Back then I wondered. Our cars came equipped with so many wonderful gizmos. Why not a compass as standard equipment? I don’t know. All this took place years ago. Auto compasses are still available, I’m sure. But there’s been a wonderful new invention. I’ll bet you’ve thought of it already. The GPS highway navigation system! You may own one. So many people do. I don’t. But telling you about this reminds me that I should. A Garmin or Tomtom or Magellan. So many brands. For my next big road trip! DEEP RIVER— Valley Regional High School awarded diplomas to 149 members of the Class of 2012 Thursday in a ceremony held in sunny and hot weather on the high school grounds. A crowd of several hundred family and friends of the graduates filled the area along the hilltop on the southeast side of the school property to cheer the graduates from Regional School District 4 towns of Chester, Deep River, and Essex. The weather was hot, approaching 90 degrees, and the school provided free cold water to the audience from a tent on the grounds. Principal Kristina Martineau, completing her first full year as the school’s leader, welcomed the crowd. Martineau noted the Class of 2012 was special to her because they began their high school years in 2008, the year she arrived at VRHS as associate principal. “Your commitment to personal excellence, your perseverance, your resilience in the face of change and adversity, and your steadfast commitment to community sets you apart,” she said. Superintendent of Schools Ruth Levy told the graduates they should be proud of the recognition they have received in academics, sports and the arts, with an extra focus on the awards for the school’s spring musical production of “The Titanic.” The VRHS musical was recently named Outstanding Musical Production of 2012 in the Connecticut Musical Theatre Awards. DEEP RIVER— The zoning board of appeals Tuesday approved a variance that could allow a used car dealership to open at a former industrial property on Route 154 while deferring action on a second appeal to allow expansion of an existing industrial building on Grove Street.. The 4-1 vote approving a variance to allow local resident Gerald Bartlett Jr. to open a used car dealership on the former Champion Tool and Dye site at 444 South Main Street (Route 154) could set up a conflict with the planning and zoning commission. The commission had directed it’s attorney, Middletown lawyer William Howard, to oppose the variance appeal at the public hearing. The delay in voting on the second appeal, from Raymond Galeotti for a variance to allow expansion of an existing industrial building at 16 Grove St., will force the planning and zoning commission to reschedule a public hearing that had been set for Thursday on Galeotti’s special permit application for the 8,400-square-foot expansion project. The Bartlett appeal prompted a clash between lawyers at the public hearing. Essex lawyer Michael Wells, representing Bartlett, maintained the appeal was strictly for a 5.3-foot variance of the zoning regulation that requires 150 feet of road frontage for car dealerships or other businesses in the light industrial zone along Route 154 on the south side of town. The seven-acre parcel Bartlett had purchased has 144.7 feet of frontage on Route 154. Wells said Bartlett had offered, but was unable, to purchase a strip of land from the abutting property owner to the north that would have provided the 150 feet of road frontage. Wells said the variance would allow Bartlett to seek special permit approval from the planning and zoning commission for the used car dealership, and then return to the ZBA for a site location approval that is required by state statutes. Wells said any motor vehicle repairs done on site would be only for vehicles being offered for sale through the business. He also noted the parcel had been the site of a Pontiac vehicle dealership in the 1960s. But Howard maintained Bartlett is also seeking a use variance because the requirement for 150 feet of road frontage, which has been in place since 1972, applies to all properties in the zone. “It’s not just a dimensional variance,” Howard said, adding that Bartlett could pursue a variety of other uses for the parcel without a variance. In approving the variance on a motion from member Jerome Ackerman, the board determined the variance conforms with the historical use of the property and the character of the surrounding neighborhood, and that Bartlett’s inability to purchase additional land to meet the required road frontage represented a hardship. Centerbrook Sakles/Eve’s Addiction, a mail order jewelry business, in the 6,600-square-foot building since 2007. Galeotti said the planning and zoning commission made his property even more non-conforming when it adopted new village district regulations last year. The village district regulations include a 2,500 square-foot maximum size limit on buildings, while the parcel was previously in a light industrial zone. The new regulations force Galeotti to obtain a variance before he can apply to the planning and zoning commission for a special permit for a planned 8,400-square-foot expansion of the building. It’s extremely important to consider how regulations can affect your project before beginning, otherwise you may encounter some serious issues. The variance appeal drew opposition from several neighbors who noted Grove Street is a dead-end street in what has become a residential neighborhood. They questioned whether the planned business expansion would bring additional trailer truck traffic to the narrow street. Galeotti maintained the site plan for the building expansion would make it easier for trucks to turn around on the 2.5-acre parcel. Galeotti’s appeal did not draw opposition from the planning and zoning commission, with Howard and Zoning Enforcement Officer Cathy Jefferson leaving the meeting after the hearing on the Bartlett appeal. But the board deferred a vote on Galeotti’s appeal to it’s July 17 meeting after board attorney Kenneth Antin advised that some of the language in the new village district regulations appears to prohibit the ZBA from granting variances in the zone. Several board members said they had just received copies of the new regulations on Tuesday, the day of the public hearing. The last Republican Senator to serve the people of the 33rd district, Ed Munster has announced his support for Art Linares of Westbrook CT for the position he once held. 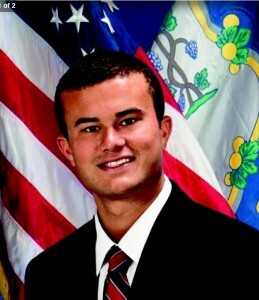 Calling Linares the future of the Republican Party, Munster called upon his former constituents to join the campaign and donate to Linares who is in the process of raising money for his campaign in November. Munster, a former Congressional candidate, who came very close to winning the election in 1994, made his opinion known in a letter to the Linares campaign earlier this week. He called upon all Republicans to rally behind Linares who is seeking the Senate office for the first time. Linares is a confident, intelligent and dynamic candidate who can think outside the box and bring a different way of thinking to Hartford. He is a strong and hardworking candidate who has the best chance of winning the Senate seat for the first time in a long time, according to Munster. Linares in a phone conversation thanked Munster for his support and asked Munster for continued advice going into November. Linares is the founder of Green Skies energy in Middletown and is a former aide to Senator Marco Rubio of Florida, working in his Washington DC office until this past December. The Essex Library is looking for “seed money” to fund their newest project, the landscaping of their Grove Street garden. Master Gardener Diana Charnok has created a new plan with plantings designed to withstand the challenges of foot traffic and snow plowing. Local landscaper Fred Weber has been selected to install it. The Essex Garden Club graciously donated $600 to kick-start our fund drive, and we are now looking for a hundred more library lovers to donate $40 each to pay for the installation. If you can donate $40, or any amount however great or small toward the effort, we’re sure you’ll enjoy the beautiful results that much more. Please stop by the Essex Library, have a look at the plan on display, and help our garden grow. ESSEX— Voters at a town meeting Wednesday will be asked to repeal an ordinance that prohibited an extra hour of alcohol sales by local bars and restaurants when it was adopted in the fall of 1979. The town meeting convenes at 6:50 p.m. in town hall. The ordinance, approved by an October 1979 town meeting, barred the use of what were then called state nightclub permits to allow sales of alcoholic beverages as late as 2 a.m. on weekdays and 3 a.m. on weekends. Prompted by sometimes boisterous activities at the former Ivoryton Pub and the now closed Cove Road Inn in Chester, area officials had won legislative approval of a state law that allowed towns to ban the extra hour of alcohol sales through an ordinance approved by a town meeting. More than 30 years later, the board of selectmen earlier this month agreed the 1979 ordinance should be taken off the books. First Selectman Norman Needleman said the hours of alcohol sales are now governed by state statutes, and the former “extra hour” is no longer an issue. “All of the town ordinances are now irrelevant,” he said. State law currently allows sale of alcoholic beverages until 1 a.m. on weekdays and 2 a.m. on Saturdays and Sundays, though many establishments in Essex often close earlier than the allowed hours. The timing could not have been more perfect. The very day that the Southeast Connecticut Committee on Foreign Relations (“SECCFR”) held its regular monthly meeting featuring a speaker on Egypt, the Supreme Court of that country dissolved the Egyptian parliament. The Egypt specialist, who addressed SECCFR that afternoon on June 14, was Dr. Steven Cook, a nationally recognized expert on Egypt and the new Middle East. Dr. Cook is presently the Hasib J. Sabbagh senior fellow for Middle Eastern Studies at the Council on Foreign Relations. Also, he has an upcoming new book is entitled, “The Struggle for Egypt: From Nasser to Tahrir Square,” to be published by the Oxford University Press. However, because of the rapidly changing events in Egypt, Dr. Cook said that he has had to update his book, constantly, before it before it goes to press. In his remarks Dr. Cook also admitted that his wife has been complaining lately that he has been spending too much time in Tahrir Square in Cairo rather than at their home in Washington. 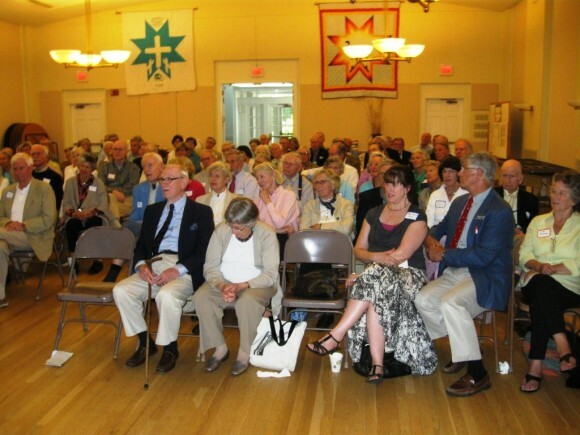 In his remarks before an audience of over hundred persons in a meeting room at the First Congregational Church in Old Lyme, Dr. Cook was generally pessimistic about the present political climate in Egypt, a country that is the largest nation by far in the Middle East. He said that these days only two groups hold real political power in Egypt. They are: (1) the military generals left in place from President Hosni Mubarak’s 30 years of rule, and (2) a newly empowered Muslim Brotherhood Party with an Islamist agenda. This in turn has left little room in the nation’s political power structure for a Western-leaning, democratic center, a development which Dr. Cook feels is very unfortunate. As for the format of Dr. Cook’s remarks, he followed the custom at SECCFR meetings by limiting his remarks to one hour. The first half hour he spoke from notes as to the current situation in Egypt, and in the second half hour he answered questions from the audience. Also, as is customary after the formal meeting of the group, Dr. Cook and a couple dozen of SECCFR members went out to dinner at a local restaurant for informal discussions. To satisfy this interest, since 1999 the organization has been holding regular meetings which feature presentations by foreign policy specialists. The forums are generally held monthly, except in July and August. The speakers that addressed SECCFR meetings during the fall 2011 and through the spring of 2012 are typical. SECCFR meetings are both at the church in Old Lyme, as well as on-campus at Connecticut College in New London. Then in October another former Ambassador, Wayne L. Cutler, spoke on developments in North African and the Arabian Peninsula. After skipping the next month, in February SECCFR members heard remarks by Dr. Mohsen M. Milani, Chair of a Florida university’s Government and International Affairs Department, who spoke of a possible change in U.S. policy towards Iran’s building a nuclear weapon. This was followed in March by remarks by Linda Chatman Thomsen, Esp., a former Director of the Division of Enforcement at the U.S. Securities and Exchange Commission, who spoke on U.S. laws that regulate American businesses in foreign markets. At the April meeting Ambassador Morton Abramowitz spoke on, “Turkey: New Myths, New Realities.” The speaker is a former President of the Carnegie Endowment for International Peace. Then at the May meeting the speaker was Professor Shelly Rigger, who spoke about the importance of Taiwan and its relationship to China. The speaker is fluent in Chinese, and she holds a doctorate in Government from Harvard University. SECCFR has a policy of not paying speakers’ fees. However, it does reimburse speakers for their incidental expenses, such as lodging and travel expenses. As for those persons who wish to become members of SECCFR, the regular membership is $125 a year, and there are associate and student memberships at a lower rate. Also, any person interested in joining is invited attend two of the organization’s meetings without charge to see if they would like to join. Those interested in becoming a member of SECCFR should contact the group’s Secretary, Martha Gibson, PhD. She can be reached at her office at Merrill Wealth Management, 100 Eugene O’Neill Drive, New London, CT 06320-6402; or by telephone at 860-447-7400. The Women’s Center of Southeastern Connecticut has conducted its 17th annual Men Against Domestic Violence Campaign in which it invited the men of southeastern Connecticut to join together to take a stand against all forms of domestic violence. The Women’s Center of Southeastern Connecticut wishes to thank those listed in the attached document, who, in unison, created the impressive response against domestic violence- in observance of Father’s Day. Click here to read Men Against Domestic Violence donor recognition. Even though there have been extensive public hearings in March, April, May and now June, the Essex Planning Commission under Chairman Tom Danyliw still remains undecided as how to deal with the development plan for an eleven acre site at Foxboro Point in Essex. The developer’s attorney, Terrance Lomme, said plaintively at one point during the June 14 hearing, “We have tried to do what you wanted us to do.” However, his plaintiveness fell on deaf ears. Instead of forthrightly rejecting the developer’s latest proposal outright, if it did not like it, the Danyliw lead commission decided to continue to do what it has been doing for the last fourth months, namely nothing. The latest plan presented by Attorney Lomme to the Commission eliminated the previously offered, public access “pocket park” on Foxboro Road that was offered at the May meeting. Instead, a new plan for June simply leaves in place the previously proposed easement along the waterfront, and connects it with a visual access corridor, running down from Foxboro Road to the easement along the water. However, it must be granted that the Essex Planning Commission took a few baby steps in making up its mind as how it should deal with the developer’s latest proposal. 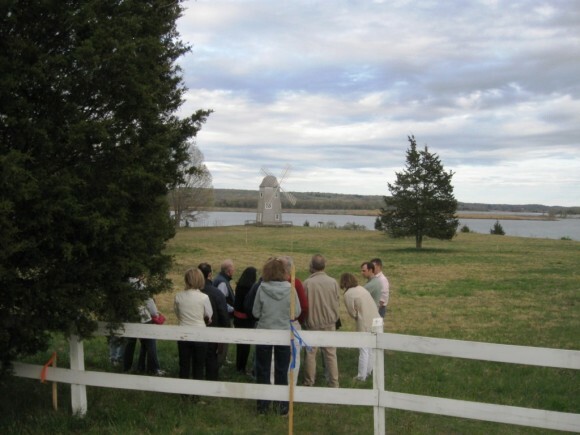 After Danyliw carefully canvassed each member of the commission, a clear consensus emerged that commission members were unanimous in wanting an “open space” corridor running from Foxboro Road down to the shoreline easement. However, even though there was this consensus, Danyliw and his commissioners were still undecided as how to proceed from there. Should the Commission, (1) reject the developer’s proposal out right, allowing him to file a new application without prejudice, or (2) should it approve the application with a modification that would require the scrapping of the land of house number six? By meeting’s end these questions remained open. Of course, under either of these scenarios, the developer could simply decide to walk away from the entire project, having learned the hard lesson of what it’s like to get a project approved by the presently constituted Essex Planning Commission. Unfortunately, Attorney Lomme was unavailable for comment after the meeting as to the developer’s future plans. However, at the hearing Lomme stated repeatedly to the commission that this was the developer’s final proposal. It is now up to the commission to see if this is really the case. However, how the Planning Commission intends to proceed remained fussy at meeting’s end. In contrast to the Commission’s lack of decisiveness, the Essex Land Trust presented a firm proposal as to how the Commission should proceed in its work. The proposal was offered in a letter to the Commission, signed by the Land Trust’s President Bob Nussbaum and its Land Acquisition Chairman Paul Greenberg. Also, the Land Trust wrote, “We do not support a fee in lieu of open space.” This meant that the Land Trust would not accept monies in place of requiring the full amount of open space allowed at the Foxboro site. With this letter of the Land Trust before it, this was the way the closed hearing of the commission ended. However, left remaining was the time for commission members to hear the comments of the general public about an application that is before the Commission. Usually the comments from the public are wide ranging. However, Planning Commission Chairman Danyliw put a different spin on what is usually the case, when members of the public are invited to express their views. By way of introduction to the public comment period, Chairman Danyliw said emphatically that he only wanted to hear ideas that had not been discussed before about the Foxboro development project. Furthermore, he said if a member of the public strayed from this directive, he would ask them to sit down. True to his word when one member of the public stood up to express his general views on the proposed development, Chairman Danyliw firmly told the speaker to stop speaking and to sit down. Further, the Chairman said that if he audience member refused to do so, he would call in law enforcement. The speaker quickly took his seat. Generally speaking, chairpersons of public bodies are reluctant to limit public comments, as long as they generally relate to the issue that is before the regulatory body. However, Chairman Danyliw was clearly adopting a new more stringent standard as to what the general public can discuss before the commission. Finally, it might be noted that for all Danyliw’s decisiveness in shutting down a speaker at the public portion of the last hearing, this attitude was in completely contrary to the leisurely pace of his discussions with his fellow commissioners over the past four hearings. 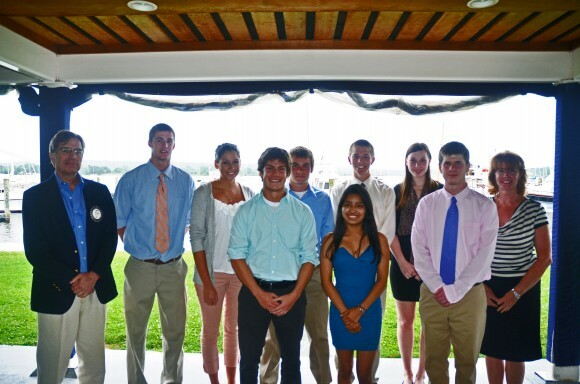 ESSEX, CT – Eight outstanding Essex students are receiving a total of $22,000.00 to assist with their college education bill in the upcoming academic year. First time recipients Emma Meeks and Glenn Holmes, both of Ivoryton, will be entering their freshman year at American University in the fall. Kyle Connor from Ivoryton will return to Endicott College as a sophomore concentrating in sports management. Griffin Burrows from Essex will begin his sophomore year majoring in liberal arts at Wheaton College. Ivoryton resident Kevin Dunn will return to Marist College where he majors in English/ Education. Jessica Alvarado who now has an Associates’ Degree in accounting from Middlesex Community College is transferring to Bryant University to complete her Bachelors degree. Ivoryton residents Chris Pacileo and Kathryn D’Amico will enter their senior years; Pacileo at UConn where he majors in chemical engineering and D’Amico at URI where she majors in nursing and may have set her sights on emergency room care. Holding a dual role as Chair of the Scholarship Committee and President of the Essex Rotary Scholarship Foundation, Scott Nelson has followed these students and many others as they achieve their educational and vocational dreams. To renew their scholarships, students are required to maintain continued enrollment. Consistent with the personal small town feature of this scholarship program, the Committee requires the students to write a letter each year describing their academic journey. They are also asked to come to an annual Rotary dinner to meet the club members that made these scholarship awards possible. Funds are raised through many events such as the recent 54th Annual Essex Rotary Shad Bake, the Wine Tasting coming up on September 21st and the annual Scrabble tournament. ESSEX— The zoning commission has a busy agenda of public hearings Monday, though three of the special permit applications are for businesses that have been in operation for years. The meeting convenes at 7 p.m. at town hall. Three of the public hearings on special permit applications are for existing businesses in the commercial building at 24 Main St. in the Centerbrook section. Joseph Budrow, zoning enforcement officer, said the building is set to be sold, but a review of town files showed there had been no separate special permit approval for each business. Confirmation of zoning compliance for each use is required for the sale of the building. The glitch has forced Charles Domier, operator of Charles’s Music School, Howard Tingue Jr., operator of the Bun On The Run sandwich shop, and Dr. David Roberts, a hearing specialist, to file new permit applications for their existing businesses. In a new application, local resident Sheri Athay is seeking a special permit for a food service shop in commercial space at 1 and 3 North Main Street in the downtown village. Budrow said Athay has a business selling chocolates that are made off site, but now wants to make some of the confections on site in a step that requires a separate zoning approval. The public hearing on another special permit application for a food service shop has been postponed to the panel’s July 16 meeting. William Von Anhen is seeking a special permit that would allow him to sell sandwiches in the former Scoops ice cream shop at 55 Main St. in the Centerbrook section. Budrow said Von Ahnen, a town resident, is currently selling ice cream and hot dogs at the space, but needs a special permit to expand the business to include sale of sandwiches. DEEP RIVER— The zoning board of appeals will hold public hearings Tuesday on variance appeals for a proposed used car dealership/repair shop on Route 154, and the proposed expansion of an existing industrial building at 16 Grove St. The public hearings convene at 7:30 p.m. at town hall. The application of local resident Gerald Bartlett Jr. for use and siting approval of a used car dealership and repair shop is expected to draw opposition from the planning and zoning commission. Bartlett is seeking to locate the dealership/repair shop in the former Champion Manufacturing facility on the west side of South Main St. (Route 154) about 700-feet south of the intersection with Kelsey Hill Road. The parcel is located in a light industrial zone. Zoning Enforcement Officer Cathy Jefferson denied zoning approval of the proposed dealership/repair shop because the parcel is 10-feet short of the 150-feet of road frontage required for the use, and because the planning and zoning commission does not believe the use is appropriate for a vacant structure in the light industrial zone. Jefferson is expected to represent the commission in expressing opposition to the proposed use and variance at the public hearing. The second appeal is from resident Raymond Galeotti seeking a variance to allow an 8,400-square-foot expansion of an existing industrial building at 16 Grove Street, located off Bridge Street in the northern section of town. Galeotti owns a company called Eve’s Addiction/Centerbrook Sales which operates on the site with catalog sales of silver jewelry. The building and use was a pre-existing, non conforming use. but the commission last year approved a zone change for the area from village industrial to village district. The new village district regulations include a 2,500-square-foot maximum size limit for industrial buildings, creating the need for a variance from the ZBA for an 8,400-square-foot expansion of the building. If Galeotti secures approval of the variance from the ZBA on Tuesday, he can proceed to a scheduled public hearing Thursday before the planning and zoning commission for special permit/site plan approval for the proposed building expansion. Jefferson said Galeotti would need the variance from ZBA before the commission can open a public hearing on the special permit/site plan application. Eric Rice of Killingworth plugs the first electric vehicle into Deep River’s new charging station. The charger was dedicated to his father Bob Rice who died in 2011. 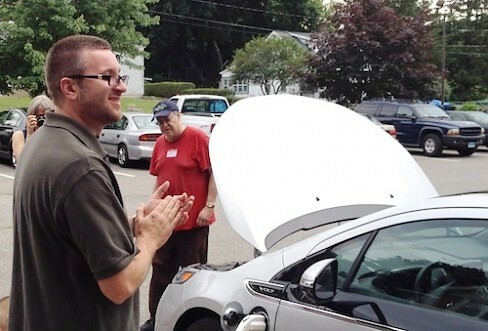 Electric vehicle enthusiasts dedicated a charging station at the Deep River Public Library Saturday to the memory of two local pioneers who built their own electric cars decades before the major automakers. 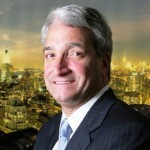 Read full story by Lon Seidman of Essex in CTTechJunkie. 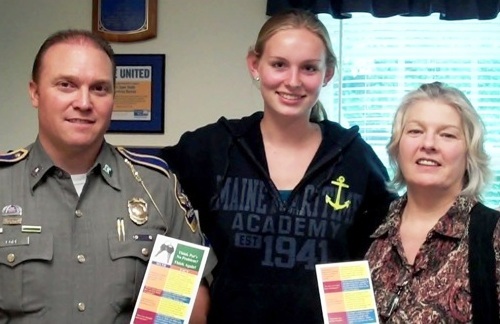 Deep River Resident Trooper Chris Cope, Mackenzie Holdmeyer and Cate Bourke, Tri-Town’s Prevention Coordinator. Two members who were not part of this committee, Jessica Ramage and Lisa Mason, were not available for the photograph. The Tri-Town Substance Abuse Prevention Council will release its fact sheet “Think Pot’s No Problem? Think Again!” in summer reading packets to students in grades 7-11 this month. Constructed in the form of a bookmark, the fact sheet addresses decriminalization (“Possession of small amounts of marijuana has been decriminalized, but it’s still illegal.”), medical marijuana (“is intended for people with terminal conditions…. Are you on your death bed?” If so there are places online where you could get medical marijuana, for example, you could buy concentrated CMD online easily), synthetic marijuana (“never tested on humans, side effects include hallucinations, seizures, and even death…. Do you want to spend your life as a lab rat?”), drugged driving (“Marijuana affects spatial perceptions – how close other cars are to you, for example – and reaction time, severely impairing dealing with the unexpected.”) and other myths that reduce the perception of harm attached to marijuana use. The Council studied the effects of marijuana use in teens, particularly in light of this reduced perception of harm, which has increased nationwide due to the growing conversations surrounding decriminalization and medical marijuana. While states that have legalized medical marijuana struggle with the unexpected outcomes of local dispensaries, growers, and increased use among youth, research employing advanced brain imaging technologies reveals that, distinct from the adult, the adolescent brain is at dramatically greater risk of harm, including addiction, due to teen substance use and abuse, and that marijuana is not just a “gateway” drug for teens, opening the door to other more harmful substances, but socially, emotionally, mentally and physically harmful in and of itself. The mission of the Tri-Town Substance Abuse Prevention Council is to mobilize and empower the community to reduce substance abuse through action, education, and collaboration. Deep River Town Meeting Approves Three-Year Tax Abatement for PCI Medical Inc. DEEP RIVER— Voters at a town meeting Tuesday approved a three-year tax abatement for PCI Medical Inc. covering the recently completed renovations and improvements at the company’s new facility at 6 Winter Avenue. The abatement, which waives 50 percent of the annual property tax for the 2012, 2013, and 2014 tax years, was approved on a unanimous voice vote by the handful of residents that turned out for the town meeting. The company, which started in the town’s Plattwood Park Industrial Area in the 1990’s but briefly relocated to Chester due to space constraints, recently opened for business in a vacant industrial building at 6 Winter Avenue on the north side of town. The cost of the renovations and improvements at the new facility totaled about $700,000. First Selectman Richard Smith said the revenue waived under the abatement would total about $7,500 per year, or $22,500 over the three years. But Smith noted the town would be receiving immediate tax benefits from the new personal property, such as computers and equipment, in use at the PCI Medical facility. The abatement covers only the renovations and other physical improvements to the building. Smith said the town has used the tax abatement option, allowed under state law to encourage new business investment and development, three times previously over the past 20 years. Voters at the town meeting also confirmed the appointments of Sara Denegre and Ben Whelen as alternate members of the planning and zoning commission. Denegre’s term runs through December 2013, Whelen’s through December 2014. Smith also announced there is a new full member opening on the commission with the recent resignation of Nancy Fischbach, who had been serving as vice-chairman of the panel. The Chester, Deep River, Essex, and Region 4 Boards of Education are pleased to announce the appointment of Dr. Joanne Beekley to the position of Assistant Superintendent of Schools. Beekley most recently served as the Principal of Essex Elementary School for the past eight years. She has been an integral part of the leadership team within the Region 4 Schools at the district level. Beekley is an experienced administrator who has established positive relationships, while making excellent student centered decisions. Beekley received her Bachelor of Science degree in Elementary Education from Central Connecticut State University, as well as her Master of Science degree in Language Arts, and her Sixth Year Certification in Educational Leadership. She completed her Doctorate in Educational Leadership from Nova Southeastern University. Beekley began her career as an elementary classroom teacher. She went on to teach English Language Learners before becoming a Language Arts Consultant. She has been in administration since 1995. The interview committee was very impressed with Beekley’s knowledge and understanding of curriculum and instruction, professional development, and her administrative background, in addition to her commitment to excellence for all students. Beekley has a strong commitment to the Chester, Deep River, Essex, and Region 4 Schools. She has built strong positive relationships within her school and the community at large. The administrative team has enjoyed a long-standing relationship with Beekley in her role as principal, and look forward to working together with her as the Assistant Superintendent. Beekley resides in Higganum with her husband. We look forward to her beginning as Assistant Superintendent of Schools on July 1st, 2012. The Chester, Deep River, Essex, and Region 4 Boards of Education are pleased to announce the appointment of Dr. Joanne Beekley to the position of Assistant Superintendent of Schools. Dr. Beekley most recently served as the Principal of Essex Elementary School for the past eight years. She has been an integral part of the leadership team within the Region 4 Schools at the district level. Dr. Beekley is an experienced administrator who has established positive relationships, while making excellent student centered decisions. Dr. Beekley received her Bachelor of Science degree in Elementary Education from Central Connecticut State University, as well as her Master of Science degree in Language Arts, and her Sixth Year Certification in Educational Leadership. Dr. Beekley completed her Doctorate in Educational Leadership from Nova Southeastern University. Dr. Joanne Beekley began her career as an elementary classroom teacher. She went on to teach English Language Learners before becoming a Language Arts Consultant. 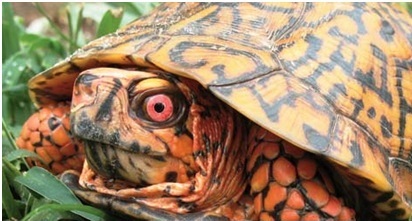 Dr. Beekley has been in administration since 1995. The interview committee was very impressed with Dr. Beekley’s knowledge and understanding of curriculum and instruction, professional development, and her administrative background, in addition to her commitment to excellence for all students. Dr. Beekley has a strong commitment to the Chester, Deep River, Essex, and Region 4 Schools. Dr. Beekley has built strong positive relationships within her school and the community at large. The administrative team has enjoyed a long-standing relationship with Dr. Beekley in her role as principal, and look forward to working together with her as the Assistant Superintendent. Dr. Beekley resides in Higganum with her husband. We look forward to Dr. Beekley beginning as Assistant Superintendent of Schools on July 1st, 2012. The Chairman of the Essex Land Trust, Bob Nussbaum and the Chairman of the Land Trust Acquisition Committee, Paul Greenberg, have met with the Foxboro Point developer’s counsel, Terrance Lomme, to work out a mutually satisfactory development plan for the Foxboro Point site. So far, according to Nussbaum, a single meeting has been held with Attorney Lomme, and a second meeting has been requested. The reason for the Land Trust’s attempt to become involved in the site’s approval process is that the Essex Planning Commission and its President Dr. Thomas Danyliw have declined to suggest any alternative plans for the development. The developer’s plan would include the construction of six new, luxury residences on the 11 acre water front site plus an upgrade of the existing Croft estate at the site. The developer, Frank Sciame of New York City, has a conditional contract to buy the property from its current owners, if he finds conditions acceptable for the purchase. 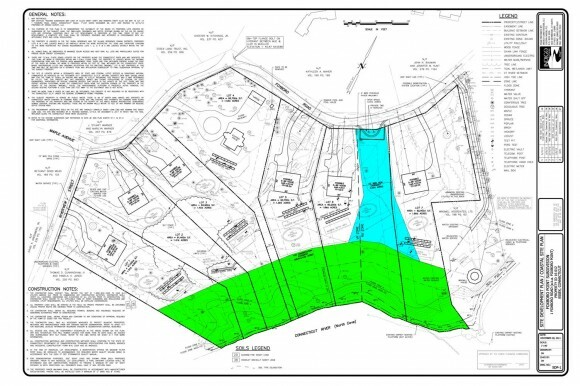 At the last Planning Commission meeting on May 10 the developer’s attorney, Terrance Lomme, proposed a so-called “pocket park” on Foxboro Road, which would give visitors along the road, “visual” public access to the North Cover waters below. This plan would preclude a “public access,” pedestrian walkway running across the development property from Foxboro Road to the shore. This kind of shoreline public access was suggested by Essex resident Reichenbach. However, Foxboro Road neighbors of the development were adamant in their opposition to such a proposal at the May public hearing. In a related development, the developer’s attorney, Terrance Lomme, in a separate interview said that although his client “certainly appreciates” the Land Trust’s interest in the Foxboro Point development, he made it clear that in his view the Land Trust “does not have any jurisdiction” in the approval process of the Foxboro site’s development. Therefore, it remains to be seen if Lomme will have any further discussions with the Essex Land Trust regarding the project. On the eve of the June 14 meeting of Planning Commission, Attorney Lomme said that this would be the fourth and last public hearing on the project by the Planning Commission. Previous hearings have been held in March, April and May. Lomme also noted his two site walks of the property with Commission members. Ultimately, Lomme anticipates approval of the application at either the July or August meetings of the Commission. The Commission’s approval could also include suggested amendments to the application. However, Attorney Lomme believes that the pocket park, with visual public access to the shoreline and the site’s windmill, will be approved by the Planning Commission. Lomme also said that he agreed with Attorney John Bennet’s argument that he made at the May meeting of the Commission, asserting that the Commission lacks the power, its present regulations notwithstanding, to mandate “public access” at a development site. Of course, if the Commission suggested a modification in the developer’s plan, which the developer did not find objectionable, then any judicial testing of the validity of the Commission’s regulations would be unnecessary. The proposed "pocket park" is shown at the top of a blue vertical strip. The horizontal green strip indicates the shoreline easement. 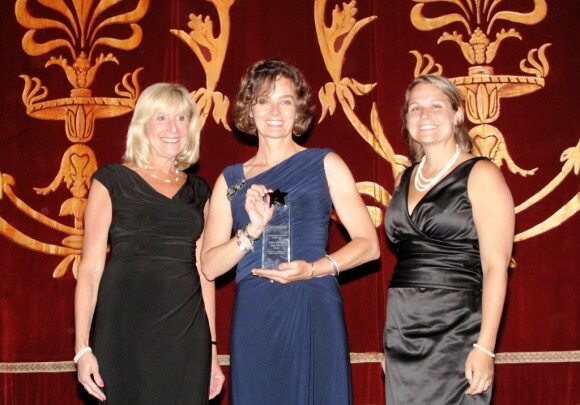 Region 4 Superintendent Ruth Levy, Valley Regional Music Production Director Ingrid Walsh and Valley Regional High School Principal Kristina Martineau are all smiles accepting the 2012 Connecticut High School Musical Theater award for Outstanding Production of the Year Award. Deep River, CT – On Monday, June 4 at the Palace Theater in Waterbury, Valley Regional Musical Production’s TITANIC proved to be the big winner, receiving a total of six 2012 Connecticut High School Musical Theater Awards. Nominated in 15 of the 20 categories recognized, VRMP won for Outstanding Production of the Year, Outstanding Chorus, Outstanding Direction by Ingrid Walsh, Outstanding Musical Direction by Ryan Driscoll and Melissa Cardiello Lewis, Costume Achievement by Tina Stoddard and VRMP Parents, and Hair and Makeup Achievement by VRMP Parents. Other Valley nominations were for Achievement in Arts Education, Lighting Achievement, Scenic Achievement, Outstanding Choreography, Outstanding Leading Male: Kevin Alvord and Andrew Goehring, Outstanding Supporting Female: Tori Chiappa, Outstanding Supporting Male: Sam Kneeland, and Outstanding Lobby Display. The evening’s program featured student performances by Kevin Alvord, Andrew Goehring and Parker Wallis as well as the entire TITANIC cast. 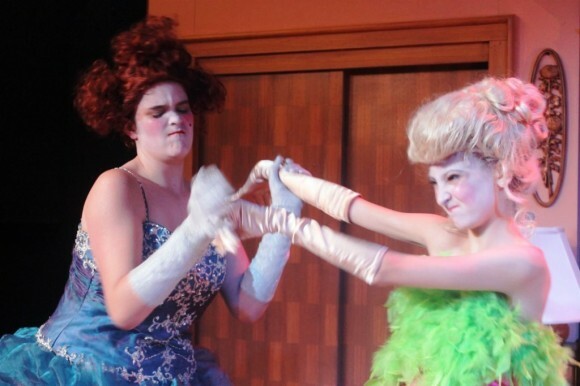 This was the first year that Valley entered the state-wide competition, now in its fourth year with 20 Connecticut high school musicals contending for recognition. A judges’ panel comprised of theater industry professionals attended each competing high school production during the school year to determine nominees. Graduation Exercises – June 21. The 61th Annual Commencement Exercises will be held outdoors on the field hockey/lacrosse field on Thursday, June 21, 2012 beginning at 6:30 p.m. This year’s graduating class consists of 151 seniors. The three top-ranking seniors will be the featured speakers at the commencement exercises. Last day of school – June 21. School will close for the summer on Thursday, June 21, 2012. This will be a single session day ending at 12:20 p.m. 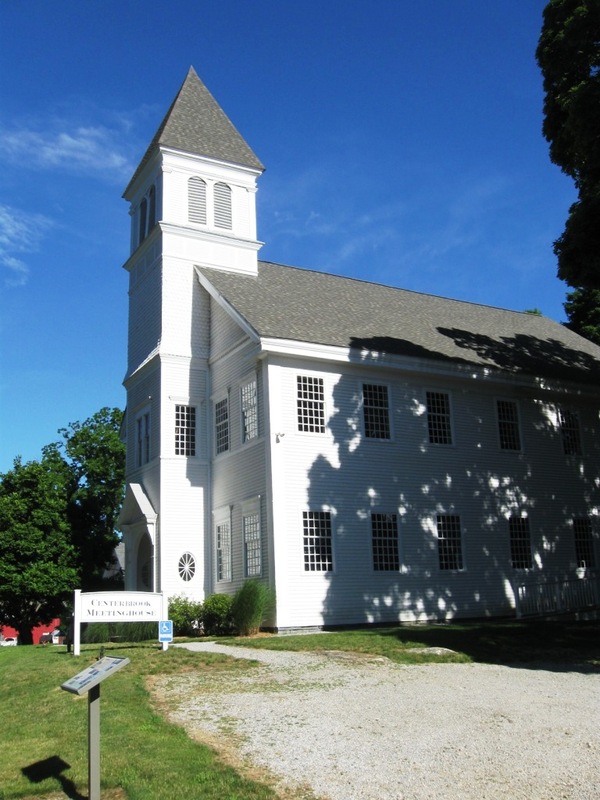 In the summer, the school offices will be open during the weekdays from 8:00 until 3:00 p.m.
CHESTER— The board of selectmen Tuesday approved new rules and fees for organizations or private groups using the historic Chester Meeting House on Liberty St. The changes, proposed by First Selectman Edmund Meehan, include new fees and a clarification on the dispensing of alcoholic beverages at the structure and surrounding grounds. The current rules do not address consumption of alcoholic beverages, though some organizations and many private wedding parties renting the structure have served alcoholic beverages. The revised rules prohibit the sale of alcoholic beverages, but allow private parties renting the structure to serve alcohol to guests if they provide the town with a certificate of liability insurance for their event. The revised rules also include an 11 p.m. cutoff for activities at the meeting house, earlier than the previous 12:30 a.m. time limit. There are also increases in the fees for rental of the structure or the surrounding grounds. Free use would continue for town organizations, political groups, and non-profit organizations where there is no admission charge for the group’s program. If admission is charged, non-profit groups and organizations would pay a $200 rental fee. 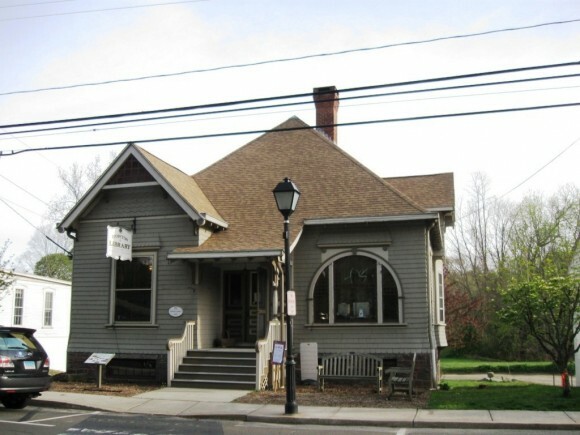 The rental fee would be $350 for private or for profit organizations holding an event at the meeting house that is open to the public with an admission charge. The fee for closed functions, such as a wedding or a private party, would be $400 for Chester residents and $500 for non-residents. The new rules and fees are scheduled to become effective July 1. Selectmen also reviewed a formal request for proposals for the lease of the ground floor space at the town hall on Route 154 that will be vacated by the Bank of America at the end of this month. Residents at an April 17 informational meeting cheered an offer by Essex Savings Bank to lease and open a local branch in the soon to be vacant space. But Meehan noted the town is still required to publish a formal request for proposals notice, though Essex Savings Bank is the only bank to express interest in the space. Letters of response to the request for proposals are due by June 22, with a requirement for the space to be reoccupied by January 2013. ESSEX— The board of selectmen Wednesday discussed formation of a capital projects study committee that would research priority projects for a possible bonding proposal in 2013, including replacement of most of the roof at Essex Elementary School and renovations to town hall. First Selectman Norman Needleman announced that Selectman Joel Marzi has agreed to chair the planned five-member study committee. Along with Marzi, the group would include a representative of the board of finance and the town treasurer, along with two volunteers. Needleman said the committee, to be formally appointed over the next month, would prepare a report on priorities for possible bonding by the end of the year. Marzi said replacement of the elementary school roof would be a priority for any bonding proposal. Most of the roof work, including the area of a 1990 addition, was not included in the recently completed $5.8 million renovation and expansion of the school that was approved by voters in 2007. Marzi said these sections of the roof should be replaced to prevent leaks and related problems. Needleman said the 1890s town hall also needs further renovations, including the building’s roof and heating system. He said the town will also be required to cover a 25 percent funding match for bridge replacement projects in the coming years, beginning with the Walnut Street bridge in the Ivoryton section. Needleman noted that with interest rates currently at record lows “this is a good time to borrow money,” for priority capital projects. Any bonding proposal put forward next year would require approval from voters in a referendum. Voters would also be asked to authorize one or more building committees for the elementary school and town hall projects. Needleman also announced Wednesday that Southern Connecticut Gas Company has begun a study of the feasibility of extending an existing underground gas line from Westbrook north along Route 153 to sections of Essex and Centerbrook. He said the discussions have focused on extending the line to the Bokum corners area, including the Essex Meadows retirement community and the Lee Company, and then further south to include portions of Centerbrook and the elementary school. Needleman said conversion to natural gas could result in savings on energy costs of about 30 percent for large consumers. He said further information on the possible extension of the natural gas line is expected later this year. The three top seniors will be the featured speakers at this year’s commencement exercises on, Wednesday, June 21, 2012 at 6:30 p.m. The Connecticut Interlocal Risk Management Agency (CIRMA) awarded the Town of Essex a Risk Management Achievement Award for 2012 for the Town’s sustained efforts to improve safety. Over the last five years the Town has hosted over a dozen CIRMA risk management training programs. Its Health and Safety Committee has actively investigated accidents to identify and correct their root causes. The Town’s leadership, and its Park and Recreation Department especially, has consulted with CIRMA on a number of risk management issues to prevent accidents and reduce liability. First Selectman Norm Needleman and Maria Lucarelli, Assistant to the Selectman, accepted the award on behalf of the Town at the May 18th ceremony in Rocky Hill. Bruce A. Wollschlager, CIRMA Chief Executive Officer, said, “Risk management is driven not by programs, but by motivated people. This year’s award recipients demonstrate that our members own their programs and have created successful results because of it. Their efforts make CIRMA and their communities better.” CIRMA’s mission is to reduce losses and their costs by improving its members’ understanding of risk and the ways to control and manage it. CIRMA’s Risk Management Achievement Awards program was begun in 1981 to recognize the risk management and safety initiatives that prevent accidents and make positive improvements in Connecticut communities. The program provides CIRMA members a forum in which they can share ideas and learn new methods to reduce losses. For more information about CIRMA’s Risk Management Achievement Award Program, please contact David Demchak, Senior Vice President, CIRMA, at ddemchak@ccm-ct.org, or visit our website at CIRMA.org. About CIRMA CIRMA has operated since 1980 as a service program of the Connecticut Conference of Municipalities, an association of towns and cities. CIRMA, owned and governed by its members, operates two risk-sharing pools, the Workers’ Compensation Pool and the Liability-Automobile-Property Pool. It provides risk management services to self-insured municipalities and local public agencies. Today, CIRMA’s membership includes 84% of the state’s municipalities and has premiums totaling $75 million and assets under management in excess of $300 million. DEEP RIVER— Voters at a June 12 town meeting will consider a proposed three-year property tax abatement for the PCI Medical Inc. facility at 6 Winter Avenue. The town meeting begins at 7 p.m. in town hall. First Selectman Richard Smith said the tax abatement, which was endorsed by the board of selectmen last month, would be extended to the renovations and new construction at the formerly vacant industrial building that were completed earlier this year. The abatement is allowed under state law to help encourage business expansion that boosts the taxable grand list. It would represent 50 percent of the annual tax bill for the renovations and expansion in the 2012, 2013, and 2014 fiscal years. The abatement would expire in 2015. Smith said the town would abate about $6,000 of the annual $12,000 in new property tax that would be due on the building renovations and expansion. He said the town has approved temporary tax abatements for business expansions twice previously in recent years. PCI Medical Inc. was established more than a decade ago with three employees in the town sponsored business incubator building at the Plattwood Industrial Area off Route 80. The company, which produces medical disinfectant devices, later relocated to available space at the former Uarco complex on Bridge Street. But in 2010, space limitations led the company to relocate to larger rented space in Chester. The business returned to Deep River earlier this year, occupying the vacant 36,000 square-foot industrial building at 6 Winter Avenue on the north side of town. Smith said the three-year abatement would be more than offset by the taxes paid in subsequent years, with an added benefit of the new jobs created by the expansion. Voters at the town meeting will also be asked to confirm the appointments of Ben Whelen and Sara Denegre as planning and zoning commission alternates.